An email from Rite Aid recently had me doing a double-take. 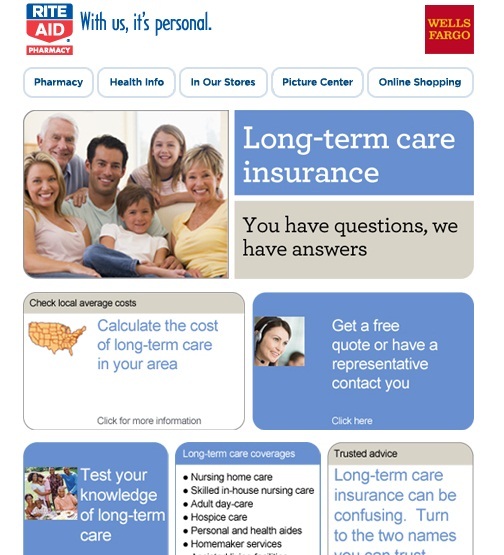 The subject line is “Rite Aid and Wells Fargo Team Up to Offer Long-Term Care Insurance”. I can see how a pharmacy could have a path into the long term care insurance business. But a bank? Upon further research I learned Wells Fargo has an insurance arm selling everything from auto insurance to pet insurance. Some types of insurance are really through another company with Wells Fargo as the middleman while others seem to be sold by Wells Fargo Insurance. This isn’t even unusual. According to a source half of all U.S. banks sell an insurance product. Banks that do have a higher median net income. Who can blame then now that they can’t earn as much from fees to you and me. Back to my original offer. Should I buy an insurance product from a bank/pharmacy partnership? One reason it is tempting is convenience. How easy to sign up right at my bank or pharmacy. It’s just as convenient for them since I’ve already given them my contact information effectively authorizing sales mail (snail or electronic). You already know you them and are reasonably happy (hopefully). Why introduce a new business relationship that may bring new hassles or problems. I worry about having too many eggs in one basket. Heck if we are concerned about Google hosting too many of our online services there is no sense in putting all your financial services in one place. Privacy concerns are another issue. It’s not necessarily in the consumer’s best interest to have the company that fills their prescription to be selling insurance where premiums may be based on health status. Maybe I’m over-thinking it but I would hesitate to buy insurance from either of these companies. What’s your thought on buying insurance from banks and/or pharmacies? Here is some simple advice when considering long-term care insurance. Buy a policy that meets your state’s guidelines, that’s called a “Partnership-qualified policy.â€ (unless you live in NY or CA). Buy a Daily Benefit that is high enough to cover most of the cost of care in your area. If home healthcare is important to you, make sure the policy allows for all of the Daily Benefit to be used for care at home. As a general rule, buy a policy that has a “Maximum Lifetime Benefit” that is close to your net worth. If you are healthy, you should probably purchase a policy on your own, rather than through your employer. I wouldn’t do it unless I was pushed to it. Every single prescription and possibly every other purchase you make in the drugstore will end up in the insurance company’s records. You know, some drugstores sell alcohol–you can buy any number of wines, beers, and hard liquors at Walgreen’s in my state. How would you like those purchases to show up in a centralized database that anyone with a little clout or a subpoena can access? And what do you think a record of buying two or three bottles of wine every week will do to your credit score? huh-uhhhh! I didn’t even think about the other pharmacy transactions. Yes, it’s not a good thing to mix these kind of business needs.